Tricolor beech trees display a striking foliage not only in fall, but in spring and summer, as well. But before discussing the unusual Tricolor beeches, let's have a look at those that are much better known: the ones that produce nuts. Once you've seen their fall foliage, you won't soon forget it. While enjoying their autumn leaves, try snacking on the nuts. Although beech trees are listed as trees for sunny areas, many report that a punishing sun can be difficult for young beeches that have yet to become established. For this reason, it may be desirable to provide some light shading for young transplants. Plant beech trees in deep, rich, moist soil. 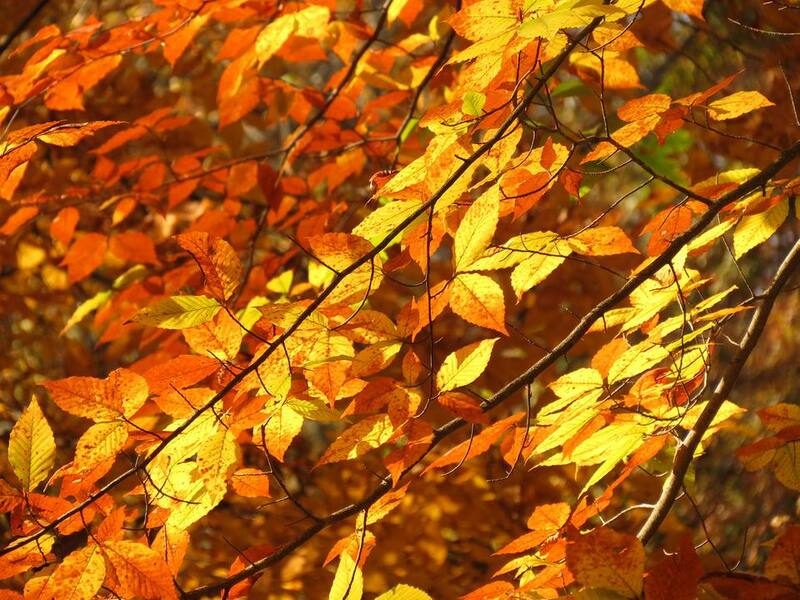 American beech trees (Fagus grandifolia) are natives of eastern North America and have golden-bronze fall foliage. The leaves persist in winter, after turning a rather pleasing tan color. But the attraction goes beyond their fall foliage and winter interest. The trademark of American beeches is their smooth, silvery-gray bark, which has been the target of numerous knife-wielding Kilroys intent on leaving behind their initials in the woods for posterity. The edible fruit of this fine fall foliage specimen, "beechnuts," ripens in fall and has an oily-sweet flavor. Deer, squirrels and blue jays also prize beechnuts. With a height of 50'-80' and a width of 40'-80', this is not a plant to grow in a small space. But if you have sufficient acreage, and live in zones 3-9, American beech trees are an impressive addition to a landscape. Their branches begin low on the trunk and shoot out horizontally, straight as an arrow. Another challenge in growing them, however, is soil compaction. This tree would not be a good choice in areas with heavy foot traffic. But if you have a large property and would like to dedicate a portion of it to woods, American beeches would be suitable for such an area. Yet another problem is that the beautiful bark of American beech trees is sometimes marred by beech bark disease. Beech bark disease results from the interaction of a fungus and an insect. If, in spite of all these difficulties, you still choose to grow American beech trees, plant them in sun to light shade in rich, well-drained soil with a pH that is acidic to neutral. A slow grower, American beech trees can live hundreds of years. The low-lying limbs of European beech trees have a horizontal branching pattern and are wildlife-friendly, affording ample screening for skiddish creatures. These limbs also make for some good visual impact in winter, meaning European (also called "common") beech trees are a useful element in composing a landscape with four-season interest. The fall foliage of the common European variety is similar to that of their American counterparts, but in some other respects the two plants do differ. European beeches will stand somewhat more foot-traffic than American beeches, making them better candidates for busy yards. They prefer a more alkaline soil (according to the Royal Horticultural Society). Zones 4-7 are the most suitable areas in which to grow them. They are somewhat smaller specimens, but they are still too large for a tiny front lawn. They have a fibrous root system, making them easier to transplant than American beech trees. European beeches respond well to heavy pruning. Combined with the longlasting quality of their leaves, this fact makes understandable their popularity as hedge plants. In fact, European beeches have also been used as bonsai specimens. An alternative to the common variety is the purple-leafed cultivar (Fagus sylvatica 'Purpurea'). "Tricolor" beech trees (Fagus sylvatica 'Roseomarginata' or Fagus sylvatica 'Purpurea Tricolor') bear an exquisite variegated foliage throughout the growing season. This is a smaller tree than the two beeches discussed above (about 30' x 30'), making it more appropriate as a lawn specimen. Hardy to zone 4, Tricolor beeches can display a number of color patterns. Sometimes you'll see purple leaves bordered by rose and light pink. Other times, green and white centers are encased in a rosy border. No two leaves are alike! Plant this tree in a shadier spot than you would either American or European beeches. This Boy Is Crying "Wolf Eyes"